We’d love your help. Let us know what’s wrong with this preview of By the Book by Dean Wesley Smith. An original adventure starring Captain Jonathan Archer and the crew of the very first USS Enterprise: Chief Engineer 'Trip' Tucker III, Chief Medical Officer Dr. Phlox, Science Officer T'Pol, Communications Officer Hoshi Sato, Tactical Officer Malcolm Reed and Helmsman Travis Mayweather. In their first few weeks in space, Captain Archer and his crew have already discovered An original adventure starring Captain Jonathan Archer and the crew of the very first USS Enterprise: Chief Engineer 'Trip' Tucker III, Chief Medical Officer Dr. Phlox, Science Officer T'Pol, Communications Officer Hoshi Sato, Tactical Officer Malcolm Reed and Helmsman Travis Mayweather. My new. Star Trek reading plan is to get thru all the Enterprise novels in tandem with my rewatch of the show, since there"s relatively few of them. The relaunch novels (starting with "The Goid That Men Do") get generally favorable press/reviews while the 6 original novels get less positive reviews. This book is a fair (but not great) start to the series: it has a decent premise, and is definitely readable, but ultimately fails to truly deliver. The two plots, while impacting each other 3.5 stars. The book is split into two parts; the first part is a first contact with an alien species that goes sideways. The second, and seemingly more important part to the authors, is a role playing game played between five of the crewman that in minor ways affect the first contact plotline. I have to applaud the authors for trying this. It is a really fresh take on a Star Trek novel. By the time this book came out there were literally hundreds of other books giving us straight ahead Star Trek stories. H The book is split into two parts; the first part is a first contact with an alien species that goes sideways. The second, and seemingly more important part to the authors, is a role playing game played between five of the crewman that in minor ways affect the first contact plotline. I have to applaud the authors for trying this. It is a really fresh take on a Star Trek novel. By the time this book came out there were literally hundreds of other books giving us straight ahead Star Trek stories. Honestly it is hard to tell them all apart as they start to run together. If nothing else, the use of a role playing game to counter-balance an otherwise standard plotline is memorable. Sadly, it didn’t completely work from a reading standpoint. The two plots are fairly separate and keep breaking up the momentum of the other plotline. Just as things start to get interesting the book switches plotlines. You end up with reading whiplash. Overall this is a middle of the road Star Trek book that is memorable more for what it tries to do more than for what it actually accomplishes. A strong effort for the first original Enterprise novel. It's clear that there were a few things that weren't set in stone about the series at the time the novel was written, but the story ends up looking a lot more like the actual series than the first original Star Trek: The Next Generation novel resembled that series. Some of the characterizations are a bit off, and a b-plot seems fairly unconnected to the main narrative, but By the Book was still an enjoyable read for the most part. Full revi A strong effort for the first original Enterprise novel. It's clear that there were a few things that weren't set in stone about the series at the time the novel was written, but the story ends up looking a lot more like the actual series than the first original Star Trek: The Next Generation novel resembled that series. Some of the characterizations are a bit off, and a b-plot seems fairly unconnected to the main narrative, but By the Book was still an enjoyable read for the most part. That was an interesting concept. I would have liked to see it from authors with some affection for the characters, or the concept of characterization, or the concept of showing as opposed to telling, or the construction of a compelling plot, or the show bible, or the Star Trek universe. Archer and his crew of the NX-01 Enterprise visit a planet of humanoids with the intention of making first contact with the residents. But the indigenous population has a very structured society with rules and conventions that the Enterprise crew doesn't fully comprehend. And why don't the residents acknowledge the southern continent of their world? While this really could have been a story for just about any Star Trek crew, what makes this one so unique as an Enterprise-Era story is that it's th Archer and his crew of the NX-01 Enterprise visit a planet of humanoids with the intention of making first contact with the residents. But the indigenous population has a very structured society with rules and conventions that the Enterprise crew doesn't fully comprehend. And why don't the residents acknowledge the southern continent of their world? While this really could have been a story for just about any Star Trek crew, what makes this one so unique as an Enterprise-Era story is that it's the first time a human crew has attempted a first contact. Archer himself is biased by how the Vulcans treated their relationship with humanity and he doesn't want to be like that to any society he meets. But as the complications and faux pas pile up, he starts to realize just how complicated this type of mission is and just how easy it could be to disrupt a fledgling society. Throughout the series up to this point, Archer has found himself confronted with his own bias and he grows more and more understanding of the Vulcans' behaviors. He may not quite get that chip off his shoulder, but understanding does bear out wisdom. There's a secondary story about Travis Mayweather and some other crew creating and enjoying a role playing game during their off hours. This will serve as an amusement to anyone who is a regular, or even casual player. While this side plot doesn't really feed the main story at all, some of the players figure in. It's a nice way to get deeper into a few of these side characters that you wouldn't normally get to see much of. In fact, a few are picked up from one of the Season 1 episodes in which they were supporting cast. Nice to see them again. Archer and his crew arrive above a strange planet containing a race that is very structured in what they do. He messes up first contact with the race. Will be ever make a good first contact? The novel flows smoothly and the characters are consistent with the TV series. Altogether a good read. This was the first original story written for the Enterprise series. It read like an Enterprise episode. It didn't have the most amazing plot, but it definitely kept me reading. Just like an episode from series 1 of Star Trek Enterprise. A good read. Very enjoyable even though a bit of time wasted on a game played by the crew which I think the story could have done without. The game device was too extensive very used but otherwise a mildly interesting read. Worth the sale price but not full. This was the first original story Enterprise novel. While the plot was a little stale, it read like an Enterprise episode and had me wanting to read more. Characters done well to the series and entire book was interesting. Surprisingly quite enjoyable. Captures the characters and spirit of the show well. Interesting tale and good first outing in the book series. The story itself is actually fairly standard for the Star Trek Universe, but it was still reasonably enjoyable. The Enterprise and its crew encounter a new planet which seems to have two distinct species. Unfortunately Captain Archer blows first contact with one of the species due to his enthusiasm and lack of patience. Things then go downhill from that point and when a crew member is incapacitated during contact with the planet's 2nd species it seems like humanity's attempts at peaceful communications with these two races may be doomed before they really have begun. The first comment I am going to have to make about this story is that alongside the first contact plotline there is a sub-plot going on which follows a selection of crew member that are playing a table top role play game. I have to admit that this sub-plot did at times distract from the main storyline and it almost felt like the authors were rushing through some sections of the story so they could get back to talking about the game. It didn't bother me hugely but I just found it hard to get excited or overly interested in some characters in a fictional universe pretending to be some other characters in another fictional universe. The role play game plot did dovetail with the main first contact storyline if you really delved into it and grasped that both the game and what they were going through on the planet were making the same point in regards to not just jumping into things but I don't think it was really required. I may have accepted the need for the game more if it really enhanced some of the characters but it is mainly secondary characters playing the game and none of them are really expanded upon anyway. Outside the role play game I did fine the story to be quite interesting and enjoyable but it was definitely a cerebral story with very little action or suspense involved. A large portion of the story covered the crew trying to understand the two species on the planet below and what protocols and structures they should be following in regards to both first contact and the running of the ship itself. This does means the story can move along quite slowly which does make it quite hard to get into. However, once the story was in full flow, I did find the debates and discourse between the various characters to be rather thought provoking and engaging. The biggest issue though with the novel though is probably the characters; some of them seem to act in very strange ways that don't really match what I know of them from the TV series. This is probably understandable though, as when the book was written the TV series itself hadn't had enough time to produce any real character development to assist the authors. I did feel that the characterization was at least slightly better than the previous novel, Broken Bow. Therefore, I am expecting that as these books progress the ability of the authors to capture the characters will improve. In addition to that I also felt that some characters were mentioned at various times to make sure that they would be in the book. The main one I am thinking about here is Trip; he just seemed to spend the entire novel hanging around the bridge for no real reason. It just got a little bit irritating constantly seeing pointless narrative about Trip standing there or making some inane comment. This has to be my favourite Star Trek book so far. I feel like it opened up to many new ideas. Enterprise enters its very own first contact situation. Unfortunately, not all goes to plan. Archer learns to appreciate the value of patience as he begins to do things 'by the book' in hope of forming a new friend with the new species. The three key characters in this book were Hoshi, T'Pol and Captain Archer. Hoshi experiences some character development in this novel by learning not to worry too much a This has to be my favourite Star Trek book so far. I feel like it opened up to many new ideas. The three key characters in this book were Hoshi, T'Pol and Captain Archer. Hoshi experiences some character development in this novel by learning not to worry too much about what's going to happen - if it's going to happen then it will do. Her frustration at learning the Fazi's language really shows through, and even makes you want to give her a wide birth. T'Pol seems to get more annoying in this novel, but thankfully her advice is finally sinking in with her colleagues. The way they interact with eachother is interesting in this novel. At the beginning of the Enterprise novels, everyone disliked T'Pol, but in this book people are backing her decisions up - Hoshi in particular. I think the two characters worked really well together. T'Pol gets her confidence from her logic, were as Hoshi is still quite warey of making her opinions known. Since the two have came to the same conclusion in this novel, it gives Hoshi a chance to add her findings to T'Pols logic to make a solid foundation for Archers decisions. The Fazi are a race who appear to be even more strict than the Vulcans, even their cities are built by certain standards, each house facing the same way, to the same degree, each chimney is on the exact same spot on every household, etc. etc. So, as you can guess, T'Pol's Vulcan experience comes in handy, it also lets Captain Archer ease up a little on the Vulcans because it shows him how easy they had their first contact! I did find this slightly amusing, because no matter what Archer does at the beginning of the book, it's all wrong. From the very beginning he should have just listened to T'Pol. This situation lets the authors display a wide range of emotions in Archer, truly showing his inner conflict. One part of the story I really could relate to was the subplot. Cutler trying to introduce a few members of the crew to a RPG; using bolts for dice and a towel as a map. I found it very amusing that they were battling against a race of bright green martians with sharp teeth and claws... their first instinct - fight! Typical human nature. Each decision had it's concequences, which I enjoyed watching. One member of the team had a particuarly bad time trying to stay alive, and was continuously ridiculed by the others. The extent of this humour almost seemed real to me, like I could hear them. In truth, the only reason this review doesn't have five stars is because I wanted more of this subplot. I wanted to join in and tell them what decision to make. My second favourite part of the novel was the shock that the second race on the planet are telepathic - and potentially leathal to humans and Fazi alike! I also liked the concept of some of the new technologies in this novel. This was a pretty decent book. It certainly had the feel of an episode of Enterprise. It was a very quick read. The only thing I don't really understand is why so much of the book was dedicated to a group of people playing an RPG. Seemed like the book must have been too short so they threw that in. Recommends it for: Any Star Trek fans, particularly of the ENT franchise. I was rather surprised by this book in the amount of enjoyment it gave. I am a huge fan of the Star Trek universe and a huge reader so it seamed very natural that I would eventually begin Trekking through the hundreds of novels available. I decided to begin with ENT (Enterprise) because I felt that it, being newer, may be more appealing as far as books go. I skipped the "novelizations" because I have already seen the shows and do not need a book version of episodes I already know. This is the fi I was rather surprised by this book in the amount of enjoyment it gave. I am a huge fan of the Star Trek universe and a huge reader so it seamed very natural that I would eventually begin Trekking through the hundreds of novels available. I decided to begin with ENT (Enterprise) because I felt that it, being newer, may be more appealing as far as books go. I skipped the "novelizations" because I have already seen the shows and do not need a book version of episodes I already know. This is the first in the series of ENT books with new adventures and I was pleased to find that the book follows the same path that many episodes usually take. I felt that through reading this book, I have discovered a lost episode of ENT that I would, otherwise, not have been able to enjoy. It began with an RPG table game which I thought was going to be the main focus. To be honest, I am unsure that I would have enjoyed the book had the RPG had any more to do with the book than it already had. But, to be fair, it did add many insights to characters I would otherwise not have known so well. And, by the end, the game really did add a feel of camaraderie that really gave it that Trek-TVshow feel. The planet and species' that the ENT crew encountered in this book were fascinating. (view spoiler)[The Fazi and the Hipon were extremely interesting to read about. I enjoyed the common misunderstanding of a new sentient race being introduced; the Hipon were believed to be attacking when they were only trying to communicate their excitement at the Humans' visit. (hide spoiler)] This is the sort of thing that really makes me love the Trekverse. I think that this book really does capture the same feel as I have become accustomed to in watching Star Trek and, because of my experience with this book, I look forward to reading the next several installments. 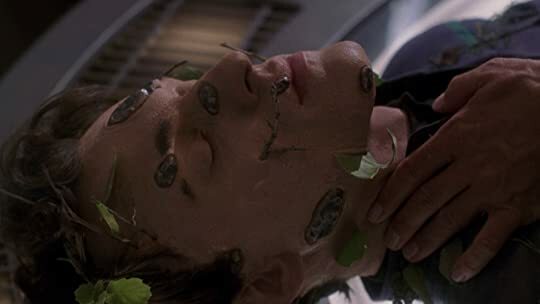 One very fascinating addition to the book was the follow-up on the character of Ethan "Alex" Novakovich which in the episode "Strange New World" S01:E04 shows Novakovich in an unfortunate transporter malfunction. (below) The book further explains his ailment and also his recovery process detailing that (view spoiler)[sand was also engrained into his skin giving him a sort of sand-pimple that his body was still working to flush out. Phlox expects a full recovery but during this book, his skin is still working to expel the particles within (hide spoiler)]. Photo of crewmenber Ethan "Alex" Novakovich taken from Memory Alpha - The Star Trek Wiki. By the Book is the first original novel starring the crew of the Starship Enterprise, NX-01. It is based upon the characters on the television show Enterprise, a precursor to the original Star Trek series shot in the 1960s. This book takes place pretty darned early in the show's history, so don't look for a lot of the characters to be fully developed. I was excited to start reading my first Enterprise book, but was confused when the first chapter contained some character that I knew little to no By the Book is the first original novel starring the crew of the Starship Enterprise, NX-01. It is based upon the characters on the television show Enterprise, a precursor to the original Star Trek series shot in the 1960s. This book takes place pretty darned early in the show's history, so don't look for a lot of the characters to be fully developed. I was excited to start reading my first Enterprise book, but was confused when the first chapter contained some character that I knew little to nothing about...and they were playing an RPG? Okay...this seemed a little different, but I accepted it. After decades of knowing about the Prime Directive, I had trouble with Archer just wanting to rush in with little thought of how his actions would affect the Fazi. One thing I didn't like about this book was how Archer was portrayed. I thought he was a little to rash, or maybe a better word is "obsessed," with making first contact, and damn the consequences! T'pol was great and the authors did a grand job of nailing her character. They also did a good job of writing Hoshi Sato. And once I accepted the RPG and Archer being irrational, I quite enjoyed the book. Sure, I would have liked to see more of the main characters of the television show, as we barely saw Commander Charles "Trip" Tucker III, Lieutenant Malcolm Reed, or Doctor Phlox, but that wasn't the focus of the book. Overall, I did enjoy Broken Bow, but was hoping for a little more. So, if you are looking for an Enterprise book, and since there are only two of them out there right now, and the first one is just the pilot from the series entitled Broken Bow, then you will want to pick this one up. Having completed the Star Trek Deep Space Nine and Voyager relaunch novels, I came across the Enterprise books. Granted, this is not part of the relaunch, which comes after the Enterprise novel Daedalus, but part of the story while the show was on. "By the Book" takes place during Enterprise's first season. A common thread among the series as a whole is that humanity has entered space with almost no documentation or direction in certain aspects, such as with alien first encounters. In this novel Having completed the Star Trek Deep Space Nine and Voyager relaunch novels, I came across the Enterprise books. Granted, this is not part of the relaunch, which comes after the Enterprise novel Daedalus, but part of the story while the show was on. 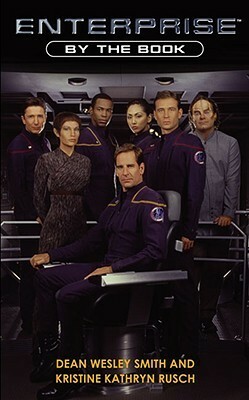 "By the Book" takes place during Enterprise's first season. A common thread among the series as a whole is that humanity has entered space with almost no documentation or direction in certain aspects, such as with alien first encounters. In this novel, Enterprise comes across the Fazi, a species that just recently started to use warp technology. Naturally, the crew of Enterprise want to simply go down and say "Hello" but various reasons prevent this from immediately happening. Meanwhile, they discover that the Fazi homeworld contains another species and their presence influences how the Fazi have developed quite substantially. The book had a bizarre combination of interesting storyline and completely off topic, out of the blue page filler. The actual plot itself was very original and quite entertaining. It's nice to read a Star Trek book that has anything to do with exploring these days. The races were quite colorful and thought provoking, and the scenario was a good read that didn't remind me of any other Star Trek book I have read. The problem with the book is that every other chapter is a filler chapter about crewmen The book had a bizarre combination of interesting storyline and completely off topic, out of the blue page filler. The problem with the book is that every other chapter is a filler chapter about crewmen who are so bored they sit around playing a game. There is no purpose or objective to it, and the game itself doesn't seem, to me at least, to even have cause to exist in the Star Trek universe. It almost feels like one of the authors simply cut and pasted half a book that they already wrote and adapted it for this one. It even felt like the author didn't think that we were entitled to an entire book, to some degree. I did find it nice to read about an underdeveloped character in the series. Apparently, one of the cast members died early on, and they had to drop the character. Book two in the ongoing series of the original Enterprise. This one I found to be a very easy read. Smooth flowing, uncomplicated. Of all the Star Trek incarnations, this one was the one I participated in the least. I am old enough to have lived through the original Kirk, Spock and McCoy and for the longest time they were my Star Trek. So taking up this series was a bit of a stretch for me. It is not bad. I enjoyed book one of the series more then this one. I guess I am a man of action and this boo Book two in the ongoing series of the original Enterprise. It is not bad. I enjoyed book one of the series more then this one. I guess I am a man of action and this book was very cerebral. Again, not all bad. The main characters develop quite nicely in this one but I would have liked to have had a least on phaser fired in anger. I will read book three, I am not ready yet to give up on the series. This book reminds me of a first season Enterprise episode: half of the story is fairly meaningless fluff while their other half isn't meaty enough to carry any of the story. A first contact story, it is clear it was written before Archer and T'Pol overcame their differences and started to work together. The mission itself is routine, boring, nearly pointless; it concerns two different species on the same planet and Archer having to learn how to be a diplomat. It is almost entirely ship-based, wh This book reminds me of a first season Enterprise episode: half of the story is fairly meaningless fluff while their other half isn't meaty enough to carry any of the story. A first contact story, it is clear it was written before Archer and T'Pol overcame their differences and started to work together. The mission itself is routine, boring, nearly pointless; it concerns two different species on the same planet and Archer having to learn how to be a diplomat. It is almost entirely ship-based, which makes the action extremely stale and mundane. A civilization that does things 'by the book' causes some tension for Captain Archer. This was my first Star Trek: Enterprise story I've ever read, being more of a fan of TOS. Still, this was...ok. Archer seemed a little out of character, being obsessed with making first contact. It was interesting seeing things before the Prime Directive that I know from the other series. Seeing several characters playing an RPG game was also a little unnerving, but intriguing once I became accustomed to the ide A civilization that does things 'by the book' causes some tension for Captain Archer. Seeing several characters playing an RPG game was also a little unnerving, but intriguing once I became accustomed to the idea. It is surprisingly very 'realistic' and smart story (for Star Trek standards) with gradually revealing of new facts about the inhabited planet. Role-playing game at the beginning is childish, but than it become a funny and cutchy storyline. If you like first-contact story without blowing out some planets and want to get know other crew members of NX-01 better (e.g. Travis, Hoshi, ...), you wont be dissapointed. So this book really read like a Star Trek Enterprise episode with all of it's ups and downs of the situation. This first contact story really captivated my interest as someone who both loves to read and watch any kind of Star Trek. It had the perfect part of characters and plot and I really liked the aliens they brought in for this. I do wish we got to see this as a real Star Trek Enterprise episode because everything described here is just amazing! The Enterprise make first contact with a new species, things don't go according to plan. Meanwhile, some crew members are playing an RPG. This is a fun, light hearted book, surprising really for the first original novel based on Enterprise. I must admit that it was the RPG that kept me reading, rather than the main plot. Don't get me wrong, the main plot was decent and all the characters act like they should. It was just the RPG was just so well written and fun. A good read. I really enjoyed this book. It is my FIRST! Original Star Trek novel that I've read, and I loved it. I really found the Fazi and the Hipon to be an interesting set of cultures on the same planet. The only thing I found out of character was T'pol's CONSTANT bickering with Archer. She doesn't bicker that much on the show and the text really made it seem like they absolutely hated each other.